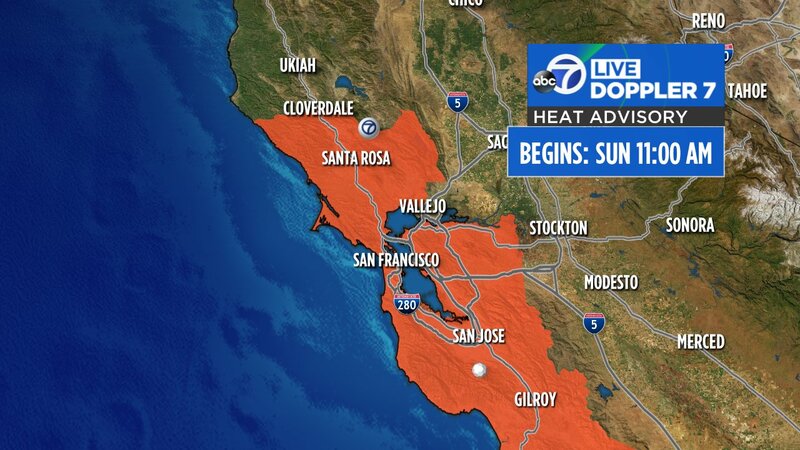 SAN FRANCISCO (KGO) -- A Heat Advisory has been posted for the entire Bay Area both Sunday and Monday from 11 a.m. to 8 p.m. Afternoon temperatures will rise well above normal each day by some 20 degrees in spots. AccuWeather is expecting widespread 90s to 100s both days. A few things you can do to stay safe in this intense heat: stay hydrated, drink plenty of water. Take frequent breaks in the shade if you are outside, or in the A/C if possible. Exercise first thing in the morning, which will be the coolest part of the day. During a Heat Advisory, temperatures rise so much that heat exhaustion and heat stroke become more likely. Cooler weather will arrive Tuesday. Click here to follow ABC7 Meteorologist Drew Tuma on Twitter and click here for the latest weather updates.